Boil all the veggies and drain water. Dry roast oats and cool it. Mix all the veggies,oats,green chutney and salt. Heat the grill and brush it with oil.Make small patties and place them on the grill. My grill is powered by electricity so the tikkis were done quite quickly.So the grilling time depends on the type of grill used.Once they are browned on both sides,sprinkle chat masala and serve hot. This can be served with green chutney mixed with curd. They look so so yumm. Grilled cutlets looks fabulous and yummy..
Looks very appetizing, so yummy. 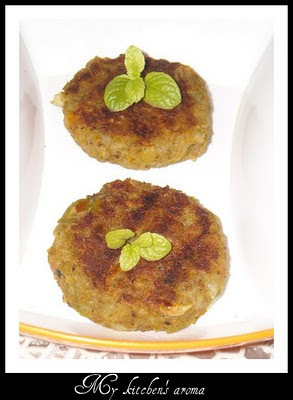 Lovely looking tikkis,like the idea of grilling the tikkis. Tikkis look so awesome ! can i get a few ? 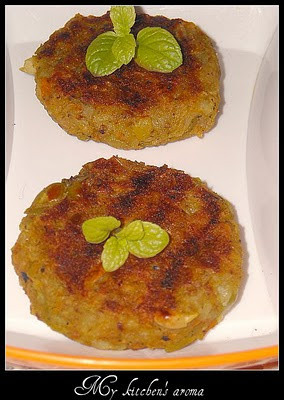 Love the idea of adding oats in the tikki and wow on adding all those veggies, surely makes it so much healthier. Grilled vegetable tikki looks delicious. That is one tasty looking dish! Hope you'll drop by at rawgirlinmumbai.blogspot.com for some rawpiration.